Hong Kong protesters fed up with an influx of visitors from the Chinese mainland are using increasingly violent methods to stop the cross-border trade that takes advantage of differing tax rates. The government has responded by changing its visa policies, but many are skeptical that a trade with such deep roots can be stopped. Meanwhile, experts warn some groups are harnessing local frustration for their own advancement. Li Wai-kyun is still haunted by what happened to him three months ago. Returning home from an evening gathering with friends in Tuen Mun Park on a March evening, the 73-year-old Hong Kong man, carrying a large box, suddenly found himself surrounded by over 10 hostile local men. In an interrogative manner, they questioned him to see if he was a "parallel trader," a term used to describe mainland shoppers who purchase products at Hong Kong's lower tax rate and resell them for a profit in the Chinese mainland. By any standard, he wasn't. The large box he carried was just loudspeakers he used to sing with friends in the park. Even so, the confrontation turned sour, and when Li took out a rubber hose to defend himself, he was pushed violently onto the ground. Fortunately, the police arrived in time to separate the man and the mob. This is just one instance of a series of protests which broke out in Hong Kong this February and March, targeting parallel traders who, as some Hongkongers complain, emptied shops selling daily necessities, boosted local shop rents, burdened transportation systems and turned Hong Kong into an over-commercialized "supermarket" for mainlanders. It's also an instance of how a technical cross-border management issue was politicized and became a tool for radical political parties to garner followers and advance their own interests. The protesters, known for their unified actions and sometimes masked faces, targeted their verbal abuse at anyone who resembled mainland tourists during their campaigns, whether they were really parallel traders or not. In more than one report, they frightened young innocent children, injured old men like Li, and campaigned in department stores, affecting their business. On April 13, possibly pressured by the rising clashes between Hongkongers and mainlanders, the Ministry of Public Security announced that Shenzhen's permanent residents will be limited to just one visit a week to Hong Kong. Previously, most of them could enter Hong Kong as frequently as they liked using their multiple-entry permits which were introduced in 2009. While the new restriction seems to have temporarily appeased the protesters, the actual effect remains to be seen. The first weekend after the new restriction was released, border areas still bustled with what looked like parallel traders on a shopping spree. According to Hong Kong's Immigration Department, 3,160 visitors visited Hong Kong through Shenzhen's Futian checkpoint every hour, similar to the average 3,110 visitors the checkpoint received each hour on Saturdays in the past 6 months. Experts say the effect of the restriction won't show until the original multiple-entry visas expire. But parallel traders have already found countermeasures to the new policy. The new restriction has triggered a boost in the sales of group visas. According to Eastweek Magazine, many mainland travel agencies started to sell L visas, which are usually used by group tourists who are not eligible for individual visits to Hong Kong. Theoretically, there is no limitation to how many L visas one can apply for and use. Parallel traders in Shenzhen can reapply every day and use the L visa to enter Hong Kong. Several hours after the policy was announced, trader recruitment ads started to appear on Hong Kong's social networking sites targeting Hongkongers, Sing Tao Daily reported. "We offer HK$600 ($77) a day for just several hours' work. The job is offered every day, as long as you're an adult," a typical advertisement read. "This shows the go-betweens have changed their strategy and are now hiring Hong Kong citizens," said Ronald Leung Kam-shing, a spokesman for the North District Parallel Imports Concern Group. But some argue that Hongkongers have always been a majority in parallel traders. In 2013, when Hong Kong imposed a restriction that limited travelers from taking a certain amount of milk formula out of Hong Kong, local media estimated that there were 20,000 parallel traders in Shenzhen and Hong Kong altogether. Hong Kong's Secretary for Security Lai Tung-kwok said about 60 percent of those arrested then were Hong Kong residents. This March, Leung said that mainlanders now contribute to 65 percent of baby formula restriction violations. In 2004, when a railway company in Hong Kong wanted to close down a train route to Shenzhen, lawmaker Leung Kwok-hung backed a group of Hong Kong parallel traders who were against it. Back then, he said the route was a way for these people to be self-reliant, showing parallel trading was a way for lower-level Hongkongers to make a living. "Parallel trading will not cease. Hongkongers have been engaged in parallel trading for over 100 years. They have parallel trading genes in them," Lau Nai-keung, a member of the Basic Law Consultative Committee, said in a meeting in April. To some extent, he was right. While parallel trading between Hong Kong and the mainland only became a hot button issue several years ago, its history can be traced back over 100 years. From the late Qing Dynasty to the 1930s, trading was active on the border, with over 3,000 traders in Hong Kong constantly bringing Western medicine and cigarettes to Shenzhen. In return, they bought agricultural products, such as rice, back to Hong Kong. In the early 1980s, after China opened up, the lack of materials in the Chinese mainland triggered another wave of parallel trading. Watches, calculators, cigarettes and alcohol from Hong Kong, which enjoys free trade, were popular in the mainland, and some Hongkongers earned a good living by smuggling them across the border. 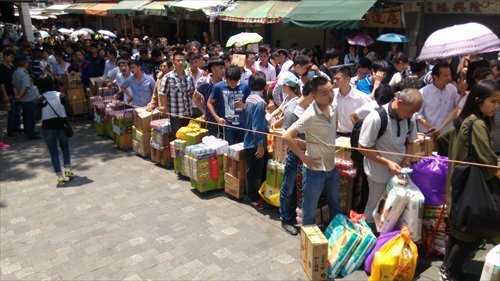 But since most of the parallel traders were Hong Kong citizens working on a small scale, neither the Hong Kong nor Shenzhen governments took serious issue with the underground trade. The twist came in 2003, when a new policy allowed travelers from the Chinese mainland to visit Hong Kong and Macao individually. Prior to the scheme, they could only visit Hong Kong in group tours. In what looks like an irony today, the policy was aimed to help Hong Kong's economy, which was in bad shape due to the outbreak of SARS. A report by Hong Kong's Legislative Council shows that in 2002, 6.38 million mainlanders visited Hong Kong, and only 7.9 percent visited on an individual basis. In 2013, the number of mainland visitors rose to 40.75 million - over five times the population of Hong Kong. Some 67.4 percent went individually. Among the individual visitors, 40.5 percent are Shenzhen residents who come with a multiple-entry visa and don't spend the night in Hong Kong, meaning they mostly come for shopping. The huge number of visitors significantly changed the retail market in Hong Kong. From 2003 to 2013, the rents in Causeway Bay, Mong Kok and Tsim Tsa Tsui, the most popular tourist destinations, rose by 3.2, 1.8 and 3.7 times respectively. Only shops selling luxuries, cosmetics and daily necessities, which are favored by mainlanders, could afford to stay open. The number of cosmetic shops rose 1,500 percent, and the number of jewelry and watch shops rose by 30.5 percent. In contrast, small shops deemed important by Hongkongers, such as old eateries and hardware shops, had to either close down or move to less desirable areas. Although the tourists brought huge economic growth and employment, by 2013, it almost became a consensus among Hong Kong citizens to reconsider the capability of Hong Kong to take in more visitors. The Hong Kong government has launched multiple crackdowns on parallel traders. Since September 2012, in a campaign that targets traders from the mainland, the immigration department has arrested 2,289 mainlanders and 14 Hong Kong residents. Most of them were just expelled back to the mainland, and only 206 were sentenced to custody, according to Southern Metropolis Daily. Parallel traders changed their strategies constantly to adjust to the changing policies. Following crackdowns, they started using a large flow of people who each carried small quantities of goods across the border, and when questioned by custom officers, they said the goods were for their own use. Civil Passion, Hong Kong's first local-rights-oriented political group, and the newly established HK Indigenous, mostly consisting of young people born after the 1990s, are two major political parties backing the parallel trading protests. Both were active in the Occupy Central movement in 2014. While the two parties are similar in ideology, they are different in style. Unlike Civil Passion, HK Indigenous openly advocates violence. "HK Indigenous leads the way in the new era of protest, where we would not be fooled by pan-democrats or ignored by the government," according to its charter. Experts say that political opportunists and young people are two major groups among parallel trade protesters. "[The political opportunists] take advantage of people's dissatisfaction to gain supporters… In every social movement, they entice the marginalized group to join them," said Cheung Chor-yung, a senior teaching fellow in the Department of Public Policy at the City University of Hong Kong. "As for the young people, they might not completely understand what they're doing and what they want, but they are always worried about potential threats that the mainland poses to Hong Kong. They have nowhere to vent their dissatisfaction with the status quo and with the traditional pan-democracy camp," he said. Cheung said these groups will not last long. "Mainstream society is against using violence on tourists. In the long term, it is problematic for them to maintain their political appeal by targeting parallel traders. They have to cooperate with traditional pan-democrats," Cheung said.